Take a look around Marrickville’s most exciting new development. 76 The Borough is a unique, fresh and fit for purpose industrial development in Marrickville, the beating heart of Sydney's hip inner-west. Possibly the last parcel of vacant land in the Marrickville area, 76 The Borough is a complex of 57 warehouse units and six large open-plan work zones carefully planned and cleverly executed in an attractive, functional and well designed development. 76 The Borough offers the perfect working lifestyle for the creative minded - artists, entrepreneurs, artisans, and tradespeople. 76 The Borough features extra wide driveways, dual street access and plenty of dedicated parking. Landscaped green zones provide a pleasant oasis in this modern working lifestyle project. PRECINCT 1 offers the kind of prestige amenity not previously seen in a Marrickville industrial development. Floor-to-ceiling windows in this impressive north facing, street front building offers abundant natural light and pleasant open plan work areas. The ground floor with its high celing, open plan workspace, and terraced cafe comprises warm timber feature walls leading into a light and spacious entry foyer. 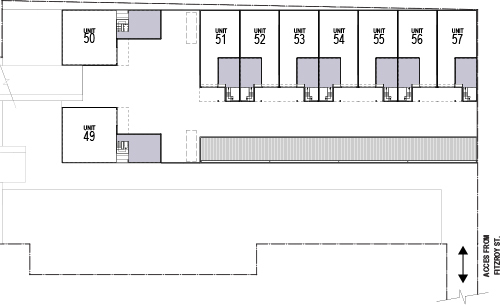 The first floor comprises an open plan work space of 386 m2. Three upper floors offer maximum open plan flexibility over floor plates of more than 600 m2. Level 5 is the penthouse level with north facing open terrace offering panoramic district and city skyline views. The total available lettable area of Precinct 1 is almost 3,000 m2. 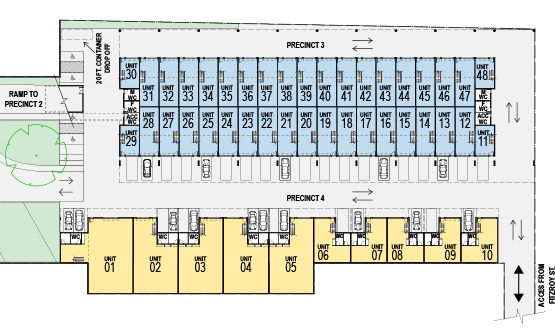 PRECINCT 2 is a series of upper-level general warehouse units easily accessed via a gentle incline ramp offering strata units ranging from 199 m2 to 223 m2. Each unit benefits from: motorised roller doors (3.5m wide), 7m high warehousing, three phase power supply, inviting stair lobby, individual bathroom and kitchen facilities, air conditioned mezzanine office space, sun-screened parking with adjacent designated external waste and recycling areas, and a dedicated container drop-off zone. PRECINCT 3 at ground level, offers a new style of business premises, the "mini-warehouse" Offering two distinct sizes; 46 m2 or 63m2. 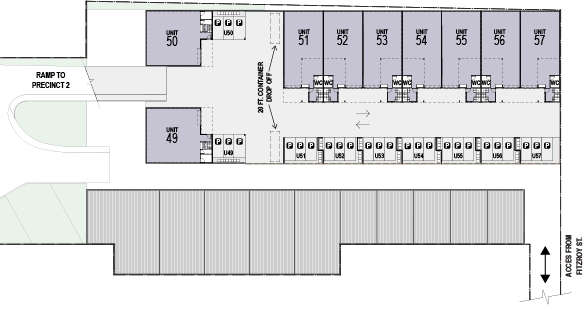 Featuring 6m high ceilings, air conditioned mezzanine office, private kitchenette, motorised roller door entries and excellent vehicular access, these ground floor units allow occupants to combine workspace, office, and storage needs in a single, modern and functional work cell. Designated communal external waste and recycling area, bathroom and shower amenities at either end of the Precinct, and a dedicated container drop-off zone. With built-in flexibility, these units are the perfect home for creative agencies, artists' studios, multi-use storage, small businesses, start-ups, and the ideal home for your prestige vehicle or motorbike collection (designed on a grid of 4.3m wide x 11m deep to comfortably accommodate two vehicles). 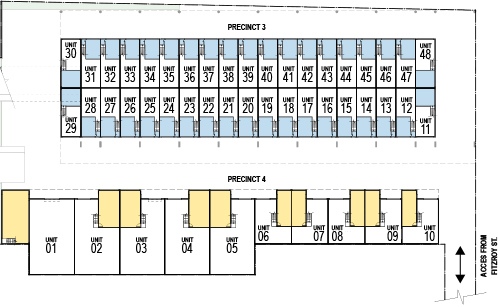 PRECINCT 4 is a ground floor stand-alone series of warehouse units from 95m2 to 290m2. These functional and well proportioned business premises feature 7m high clearance warehousing, wide motorised roller doors (3.2m to 3.5m), three phase power supply, air conditioned mezzanine office, private kitchenette facilities, bathroom, storage with provision for shower facilities, allocated parking, and excellent extra-wide driveway and truck turning areas. Across all Precincts, "drop-off container zones" allow all day stationing of containers, offering flexibility of work and storage amenity. Thoroughly urban, 76 The Borough is within easy walking distance to great cafes, restaurants, edgy retail stores, and top-notch recreational facilities including Marrickville Metro Shopping Centre, Marrickville Aquatic Centre, Henson Park Sports field and the landscaped green space of Sydney Park. 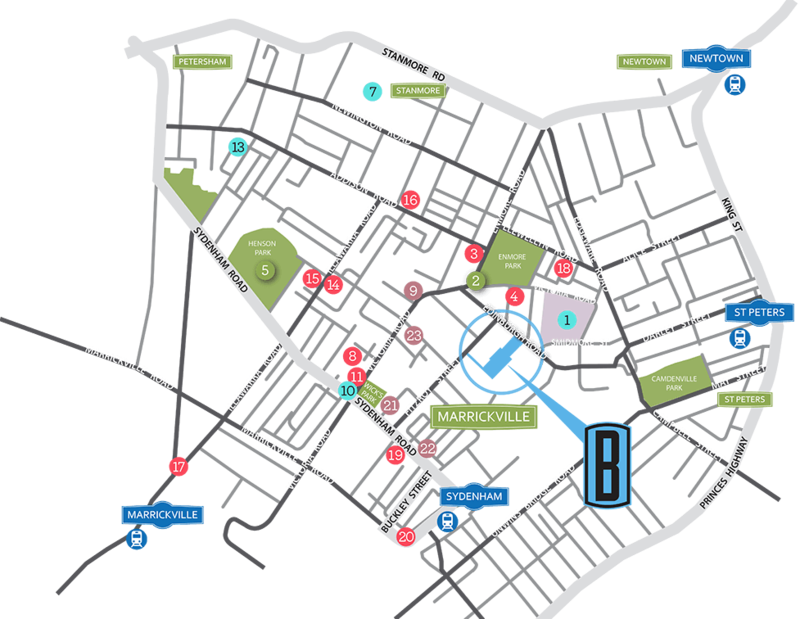 Marrickville is a thriving area of hip cafes, boutiques, galleries and organic food and farmers market. Its tree lined streets with terrace houses and workers cottages make for a charming streetscape. People are attracted to the Marrickville area because of its convenience and inner city character, its vibrant street culture, multicultural influences, eating and shopping experiences, and its friendly community feel. Located along two major suburban train lines providing easy access to all areas of Sydney, 76 The Borough is the place to be. Spirecorp is a property development and development management company known for its ability to deliver quality, creative, and leading edge projects. Spirecorp's strength is in identifying development opportunities across all sectors of the market. 76 The Borough is the latest project to hit the market raising the bar with this well planned and carefully designed business estate. As Project Co-ordinator Spirecorp has been awarded the task of managing this project through to completion. Formed in 1992, City Alliance specialises in retail, commercial & industrial property sales & leasing, strata and subdivision consultancy, and market advice for proposed developments. It is also proficient in project marketing for commercial, industrial, mixed-use schemes and residential projects, and the sale of development sites & adaptive re-use buildings. At City Alliance, clients deal direct with the principals, every step of the way. Founded in 1998, Bennett Murada is a boutique architectural practice that prides itself on a hands-on, responsive, director level client interface at all stages of the design process. Specialities include master planning, and design and delivery of a broad range of typologies including multi residential, industrial, commercial and single dwelling projects. Bennett Murada's ethos is 'simple things, executed beautifully'. Fill out the form below and someone from our office will contact you as soon as possible.